Some Tips for Boosting Your Blog,s Alexa Rank. 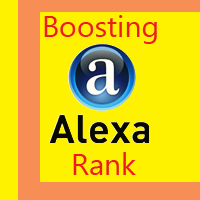 Alexa traffic ranking is one of ranking systems on how many visitors a "Blog" are receives.The highest sites, (Google and Yahoo) also get the highest ratings due to the millions of people visiting them every time. Download Alexa toolbar for more information on your Alexa ranking and, Alexa toolbar and getting an idea of where you’re starting from. It’s completely free to use Alexa service. after Install the Alexa toolbar on computer so, Everyone should know about your targets. Concentrate on increasing visits by setting your blog and website as the browser’s homepage. Many blogs are creating for the purposes of a "Business". after Install the Alexa toolbar on everyone should know about your targets and what you trying to do. and these extra visitors help to improve your numbers of traffic. How To Make Money Online ...:::: Earn Methods ::::... Use (Pay Per Click) via Google to buy advertising on search engines. This will provide you with more targeted traffic. and your blog, receive more links. and this traffic is more likely to come back to your site regularly bases. Your friends also can play a part in your Alexa ranking in search engines. because right person might just see it and come to your blog. For Alexa rankings on your blog. You will get a handsome amount of clicks every day. you do everything you can to promote your website/blog. and the most popular way of promotion is social networking websites like Facebook or Twitter. So social media sites build your following daily bases. Your goal is not to get someone to click on your blog,s page only. but you also add some pictures and Good banners to make them more appealing of your blog. if your "Blogs" looking cool, user come back to your blog again and again.